Call 219-440-4760 to schedule your first appointment. If you keep turning up the television volume or can't hear people speaking to you in a noisy restaurant, then you might be experiencing hearing loss. When you visit Miracle-Ear®, you'll be able to learn about hearing aids in Merrillville, IN that could improve your listening experience. Our caring hearing care specialists will discuss all the signs of hearing loss with you and then suggest a solution. Our GENIUS™ Technology is built with advanced micro technology sound processors that produce high-definition digital sound. These hearing solutions are designed to enhance your ability to recognize speech, and they feature significant improvements upon hearing aids of the past. Issues like wind noise and feedback have been largely eliminated by Wireless Windscreen. While undesirable noises are reduced, GENIUS™ Technology is also highly sensitive to speaking voices. It could greatly improve your ability to understand multiple people from many directions. You'll also be in control of your audio experience. Our hearing aids can be connected via Bluetooth® to your telephone, television, or MP3 player. We've even developed a smartphone app*, so you can adjust settings and fine-tune your listening experience no matter where you are. As you try on different hearing aids, we'll evaluate them with you based on both audio experience and comfort. After you make your choice, you'll receive a 30-day risk-free trial† in order to test the hearing aid in your day-to-day life. Our products could empower you to rekindle your social life or listen to your favorite music like you used to do. Because of the performance of our hearing aids, Miracle-Ear is the most recognized hearing aid brand in America. Our hearing aid center serves Merrillville, Hobart, and the surrounding areas. To make an appointment, call us today. 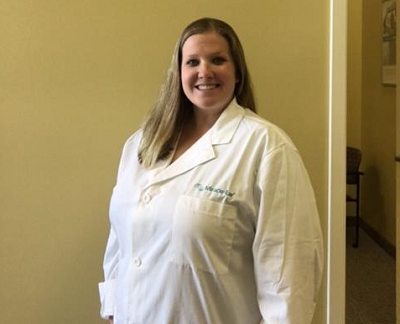 I have five years of experience as a hearing instrument specialist and previously worked as a patient care coordinator at a hearing clinic. I have my Bachelors degree in Communication Sciences and Disorders from Western Illinois University. I have atteneded many workshops over the last five years to improve my skills as a hearing instrument specialist. My favorite part of working at Miracle Ear is getting the opportunity to help people with their hearing health every day.